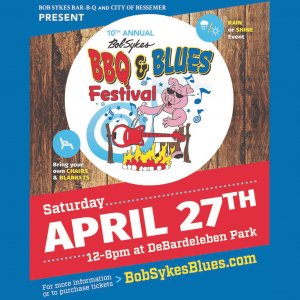 1047 WZZK, Bob Sykes BBQ, and the City of Bessemer present the 10th annual Bob Sykes BBQ and Blues Festival live inside DeBardeleben Park in Bessemer! Bring your blankets, lawn chairs, family, and a big appetite and enjoy great BBQ and music from some of the best blues artists live in concert! Plus, there will be vendors, kids activities, and more! Listen to win your passes from WZZK & join us at Bob Sykes Blues and BBQ festival Saturday April 27th!